Hundreds of people, including children as young as 10, have been killed or beaten in Zimbabwe in recent days in a crackdown the regime has tried to hide by shutting down the internet and deporting foreign journalists. The violence comes as the country's president heads to the economic summit in Davos by private jet tomorrow to brush shoulders with the rich and powerful in his quest for international recognition and investment in his bankrupt nation. Last week civil society groups, led by the Crisis in Zimbabwe Coalition, wrote to the EU accusing President Emmerson Mnangagwa of using "murder of unarmed civilians as a tool to retain power". They demanded that he be barred from entering Switzerland unless he "immediately cease the ongoing human rights violations". The government has admitted only to three deaths and 300 detentions, but in the past few days The Sunday Times has secretly met hundreds of people in safe houses, hospitals and courts who have been beaten or had dogs set on them by masked police or soldiers. Among them were a 15-year-old girl and a 10-year-old boy. The closure of the internet for periods since Tuesday, on government orders, has made information difficult to obtain, but a doctor at Harare's biggest hospital said the morgue was full. One western diplomat said they had heard of as many as 200 deaths, certainly 50. The Zimbabwe Association of Doctors for Human Rights said they had treated 72 people for gunshot wounds. Hundreds of people have been detained and denied bail by magistrates who seem to be acting on government orders. When diplomats demanded a meeting with the government, they were given what one described as "a command briefing" by Cain Mathema, the acting foreign minister. No questions were allowed. The crackdown followed a more than doubling of fuel prices, with petrol costing $3.31 a litre, the most expensive in the world. It prompted a nationwide shutdown on Monday as well as protests and looting. The midnight abductions and widespread beatings across the country that followed represent another dashing of hopes for Zimbabweans who believed things would change with the removal of long-time dictator Robert Mugabe, 94, whose authoritarian 37-year rule ended in November 2017. Last August six people were shot in front of foreign journalists during protests against the election of Mnangagwa, who had been Mugabe's deputy and right-hand man for decades but has tried to sell himself internationally as something new. "This is worse than Mugabe," said Nelson Chamisa, leader of the opposition Movement for Democratic Change. "These are old wolves in new clothing, using the same old methods of human rights abuses and internal displacement. They are telling the world they are open for business when they are selling a dummy." He spoke after attending the funeral of Kelvin Tinashe Choto, 22, a talented footballer and captain of the team in his township of Chitungwiza, who was one of those shot. 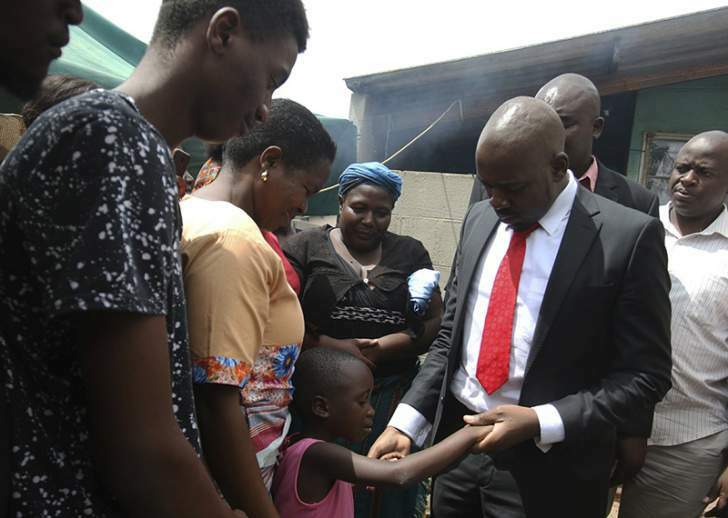 Chamisa paid tribute to "a young man with a bright future who was not politically involved in any way, yet was so badly shot his skull could not be reconstructed".